Shopping Aspen | Kemo Sabe | A Continuous Lean. For a minute I came really close to buying a Stetson hat. I was watching the folks at Kemo Sabe steam and re-fit an old hat that had fallen out of shape over the years – and I am thinking “I need a Stetson hat.” Not want, need. Luckily I came to my senses in time to avoid what could have been a silly impulse buy. Not silly because of Stetson (they make some really great hats), but silly because I will never wear that, ever. Kemo Sabe is that type of store. I did end up leaving with a pair of Geier gloves (who are residents of The American List) and soaked in all of the western wear. Boots from Lucchese, Pendleton blankets, gloves, bags and lots of other good stuff. Sort of something a little different than the stuff I feature on ACL, but it was a fun diversion for the day-to-day stuff I tend to shop. I love your blog! It’s wordpress powered, yes? Thanks so sharing so many amazing things! Whatever you do in life, never, ever put a cowboy hat on your head. Like blue jeans, cowboy hats were designed for one specific purpose–to protect you from sun while staying on your head in a high wind. Unless you are at this minute on horseback, herding cattle, this hat is as inappropriate as a football helmet. The human being who does not look ridiculous in a cowboy hat has not been born. If you wear one, people will think either: 1. A giant moth has landed on your head, or 2. you are impersonating the Flying Nun. That is certainly not a hard and fast rule. It depends more on where you live than your occupation. I can tell you right now that ranchers are not the only ones who wear cowboy hats. If you’re from a big city or from the northeast or some other urban area, yes you will probably look ridiculous wearing a cowboy hat. It’s probably a good idea to avoid it. However, if you’re like me and live in a small town in Oklahoma, tons of people wear cowboy hats who are not active ranchers. For example, auctioneers, equipment suppliers and even bankers around here wear them because over time it’s become a part of the style of the area. Anybody who thinks there are not places where people actually wear cowboy hats and boots without the hipster sense of irony have not actually been anywhere in rural America. You my dear, are ignorant. accessory traditions are still alive and well. Greg D is correct. Point of amplification: A cowboy hat will not stay on your head in a high wind, except with a wind string and luck. A backwards-facing baseball cap is better. 1000 Bonus Points to Grant. Good Man. 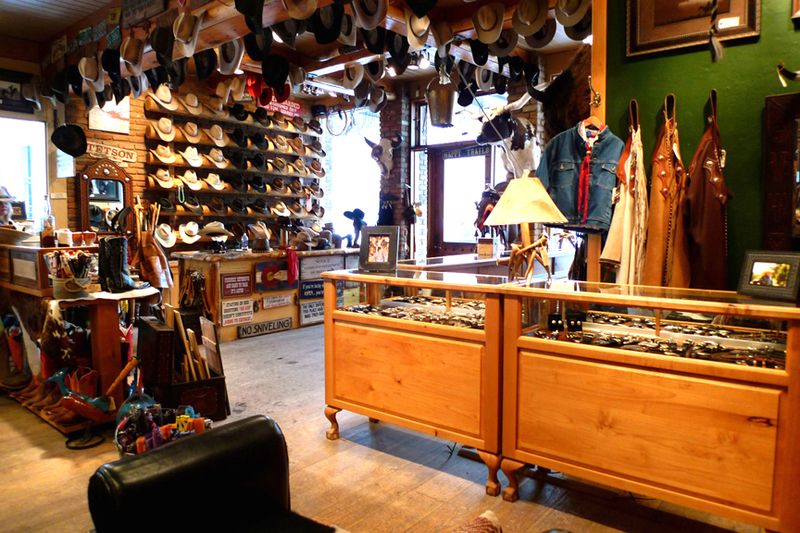 There’s a great shop in Telluride that sells Bounty Hunter hats, and it features a sign that reads “You will never own a great hat unless you are impulsive.” It’s true. My impulse purchase of a great Bounty Hunter hat occurred about 10 years ago, and though I don’t wear it all that often, I don’t regret it a bit. Wow! I wish that I lived near that place … looks perfect for me to pick out my next pair of cowboy boots.